Product information "PARG Inhibitor PDD00017273"
White to off-white solid. Soluble in DMSO, methanol or acetonitrile. 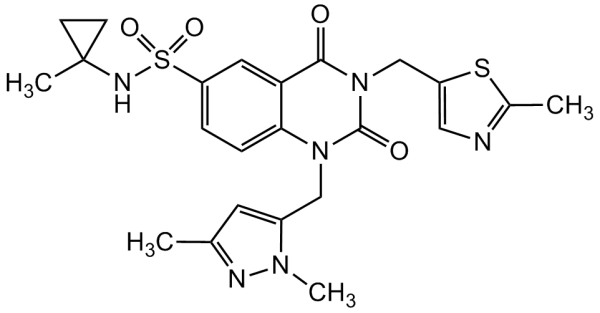 Human poly(ADP-ribose) glycohydrolase (PARG) inhibitor for in vitro studies, Inhibits human recombinant PARG enzymes (IC50=26nM) and PARG in cell assays (IC50=37nM). Inactive against related glycohydrolases ARH3 and PARP1s (IC50>,30µ,M). Showed no cytotoxicity (IC50>,30µ,M), Poly(ADP ribose) glycohydrolase (PARG) is a critical component in the repair of single strand DNA breaks and therefore a target in cancer cells. PARG counteracts the function of the ARTD family of poly(ADP ribose) polymerases (known as PARPs) by efficiently catalysing the hydrolysis of O-glycosidic linkages of ADP-ribose polymer, thereby reversing the effects of PARPs. Customer review for "PARG Inhibitor PDD00017273"